Latest IIT Recruitment: Good news for the Aspirants looking for a Central Government jobs, now Indian Institute of Technology Delhi (IIT Delhi) published an official notification for 19 post to fill the Medical Officers, Junior Engineer and Various Assistants, work in Hauz Khas, New Delhi. Candidates must go through the official IIT Delhi recruitment notification thoroughly before apply for Medical Officers, Junior Engineer and Various Assistants post. IIT Delhi Various Disciplines job application is collected through Online mode only. The applicant meets the eligibility norms of IIT Delhi only apply for the Medical Officers, Junior Engineer and Various Assistants, else ignore. Aspirants have a golden opportunity in the IIT Delhi. Applications are invited to the Medical Officers, Junior Engineer and Various Assistants in Indian Institute of Technology Delhi (IIT Delhi). Aspirants can apply only by Online, application forms is available online from 17-11-2018 to 10-12-2018 18:00 to the IIT Delhi latest job notification 2018. The Aspirants are requested to read some basic information about the IIT Delhi job notification 2018 like eligibility criteria, age limit, selection process and more given below. Before applying, candidates are requested to read the official notification of IIT Delhi Recruitment 2018 for more detail and correct information on their official website(http://www.iitd.ac.in/). 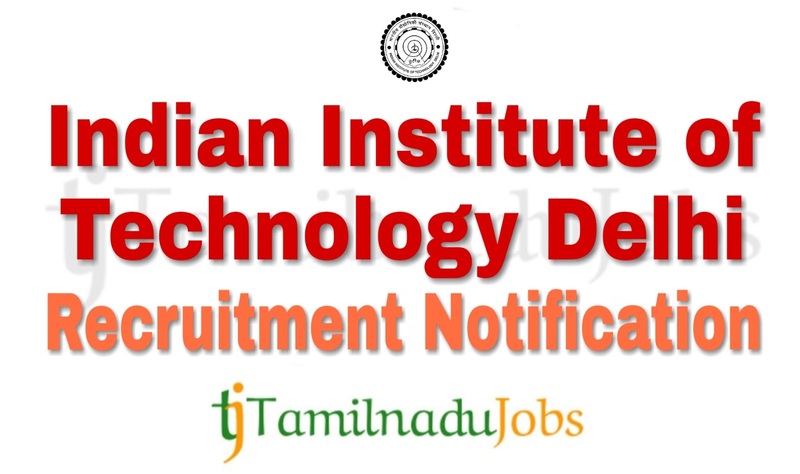 In the recent Recruitment Notification, the following vacancy details given by the Indian Institute of Technology Delhi (IIT Delhi) and aspirants should go through the vacancy details and eligibility details for more detail in IIT Delhi notification link given below before applying. Vacancy details of IIT Delhi is given below. Here we give only the education and age limit criteria for the IIT Delhi Recruitment notification 2018. For more detail Medical Officers, Junior Engineer and Various Assistants eligibility details like physical fitness and more, read official notification. Before apply for Medical Officers, Junior Engineer and Various Assistants job, candidates must go through the eligibility details in official notification of IIT Delhi Medical Officers, Junior Engineer and Various Assistants. Aspirants meet the education qualification of Indian Institute of Technology Delhi (IIT Delhi) only apply for the Medical Officers, Junior Engineer and Various Assistants job. IIT Delhi Recruitment notification 2018, education qualification are given below. Assistant Registrar: Must have a Master degree or its equivalent with at least 55 % marks or its equivalent Grade of B in the UGC seven points scale and consistently good academic record set out in these Regulations. And also have At least 05 years relevant administrative experience in supervisory capacity in a Govt. office or university or technological institution. Junior Engineer (Civil): Must have a Bachelor Degree or equivalent in Engineering (Civil Engineering) with at least 55% marks and 02 years of relevant experience. Junior Superintendent (Publication):Must have a Master Degree in any discipline preferably in Science with at least 55% marks with PG Diploma in Journalism and having 01 year experience in Proofreading or Editing in a reputed organisation. Should have knowledge of all aspects of production of journals or books or periodicals. Should have good command over English and Hindi language. Library Information Assistant: Must have a M.Lib.Sc. or MLISc or equivalent with at least 55% marks, At least 01 years working experience in a reputed library. Aspirants who want to apply for IIT Delhi Various Disciplines 2018, must attain the following age limits given by Indian Institute of Technology Delhi (IIT Delhi). Given Age attained aspirants can apply for the IIT Delhi Various Disciplines job. Aspirant apply for Medical Officer and Assistant Registrar maximum age limit is 40 yrs, Junior Engineer (Civil) and Junior Superintendent (Publication) maximum age limit is 35 yrs, Library Information Assistant maximum age limit is 30 yrs and Junior Laboratory Assistant (Management Studies) and Junior Assistant (Accounts) maximum age limit is 27 yrs as on 10-12-2018 to apply for the IIT Delhi Recruitment 2018. The application fees for Indian Institute of Technology Delhi (IIT Delhi) Medical Officers, Junior Engineer and Various Assistants 2018 differ according to various categories. Aspirants will have to pay the application fees for IIT Delhi Various Disciplines via Online modes only. The application fees details for IIT Delhi Various Disciplines given below. Aspirants have to pass the following selection process given by Indian Institute of Technology Delhi (IIT Delhi) to get Medical Officers, Junior Engineer and Various Assistants job. For more detail and correct information check in the official website of IIT Delhi. How to Apply IIT Delhi Various Disciplines 2018? Step 3: Fill the details required by IIT Delhi in the form. Step 5: Before submitting the application for Medical Officers, Junior Engineer and Various Assistants, check the details are correct, then press submit and pay the application fee. 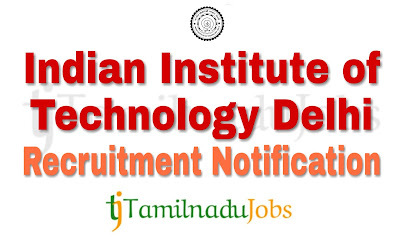 Indian Institute of Technology Delhi (IIT Delhi) is announced the recruitment for the Medical Officers, Junior Engineer and Various Assistants to full fill their 19 posts. Aspirants can check the salary details for the Medical Officers, Junior Engineer and Various Assistants in IIT Delhi.